This book will teach you what you need to know to start using GitHub effectively for collaborating and working on your software projects. Effectively use GitHub by learning its key features to leverage the power of Git and make collaboration on code easy to work with. Be more productive on the development workflow of your projects using the valuable toolset that GitHub provides. Explore the world of GitHub by following simple, step-by-step, real-world scenarios accompanied by helpful, explanatory screenshots. 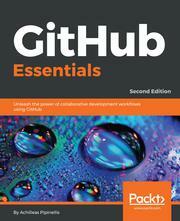 This book is for experienced or novice developers with a basic knowledge of Git. If you ever wanted to learn how big projects such as Twitter, Google, or even GitHub collaborate on code, then this book is for you. Whether you are an experienced developer or a novice, learning to work with Version Control Systems is a must in the software development world. Git is the most popular tool for that purpose, and GitHub was built around it, leveraging its powers by bringing it to the web. Starting with the basics of creating a repository, you will then learn how to manage the issue tracker, the place where discussions about your project take place. Continuing our journey, we will explore how to use the wiki and write rich documentation that will accompany your project. You will also master organization/team management and some of the features that made GitHub so well known, including pull requests. Next, we will focus on creating simple web pages hosted on GitHub and lastly, we will explore the settings that are configurable for a user and a repository. This book will take you through some of the most important features of one of the most popular tools, GitHub, which is used to bring developers together from all around the world to discover, share, and build better software. At each step of the way, you will learn about important approaches used in GitHub, including creating a repository, managing teams, creating GitHub pages, and watching your repository's web analytics, among others.